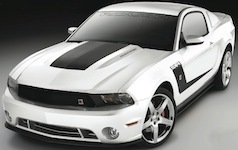 In 2012 Roush has a whole line-up of special upgrade packages and performance components for the Mustang. Vehicle lineup includes the Stage 1, Stage 2, Stage 3, and Stage 3 Hyper Series. The Stage 1 includes the front and rear body panels, interior upgrades, and Roush badges. Stage 2 adds performance handling, wheels, and tires. Stage 3 adds a 540hp supercharger, exhaust, added handling, and graphics. The Hyper Series which comes in black adds custom color accents to their four models called: "Mat It Mango", "Gas It Green", "Punch It Purple", and "Launch It Lemon". Hero card for the 2012 Roush Stage 3 Mustang coupe. It says, Redefining a legend requires a vision that raises the bar. One must design with passion, while engineering without compromise. Just "Good enough" is not an option. This is a Black 2012 Mustang Roush Stage 3 Hyper Series with the 'Punch It Purple' (purple) accents. It is serial number 2 of 25 built. It has the 540+hp supercharged 5.0L V8 engine and all the Roush suspension and body enhancements. The other 3 Hyper Series models are Roush also made three other Hyper Series models - "Mat It Mango", "Gas It Green", and "Launch It Lemon". This is a Black 2012 Mustang Roush Stage 3 Hyper Series with the 'Gas It Green' (green) accents. It is serial number 5 of 25 built. It has the big RoushCharged 5.0L V8 engine pushing out over 540 horsepower. Roush also made three other Hyper Series models - "Mat It Mango", "Punch It Purple", and "Launch It Lemon". This is a Roush factory photo of their Black 2012 Roush Mustang Stage 3 Hyper Series in "Launch It Lemon". This is one of four Hyper Series models the others are Roush also made three other Hyper Series models - "Mat It Mango", "Punch It Purple", and "Gas It Green".